Automation systems help reduce energy consumption, add operating efficiency, but cost still matters. Calling a building “smart” implies that technology is embedded to make that building more efficient, useful, convenient and profitable. The goal is to program efficiency beyond what humans can provide. But “smart” also may imply a healthy dose of marketing hype. No one wants to live in a “dumb building,” but it’s difficult to define what makes a building smart. And while much is happening now to put real intelligence into buildings—a field known as building automation, it remains to be seen how widely that technology is adopted. And in some markets, there is certainly good reason to invest in this technology. Various reports forecast a compound annual growth rate ranging from 10% to 13% in the near future, with the building automation market reaching about $100 billion in 2022. Smart buildings also tie into smart city and smart power-grid technologies, with building automation playing an important part in sustainable building and resource management, some of which are built into local building codes. Companies working on smart building projects are automating the functions of heating, ventilation and air conditioning (HVAC), the physical security of a structure, energy use, location technology, as well as other areas that building owners and their tenants care about. Better networks, increased connectivity and more compute power are making automation projects possible. Sensors, controllers, and servers are generally the building blocks of building automation systems, said Dave Clark, a facilities technical services manager at Mentor, a Siemens Business. The computing systems capture trends in the data generated by the sensors and do analysis. Simply put, building automation systems are Internet of Things (IoT) projects mixed with control and automation. Sensors that monitor a local condition send the data about the condition via a high-speed network to be processed. The data is then used to initiate a decision and take an action. The rule of thumb in designing building automation is security, reliability and ease of use for customers, in that order. 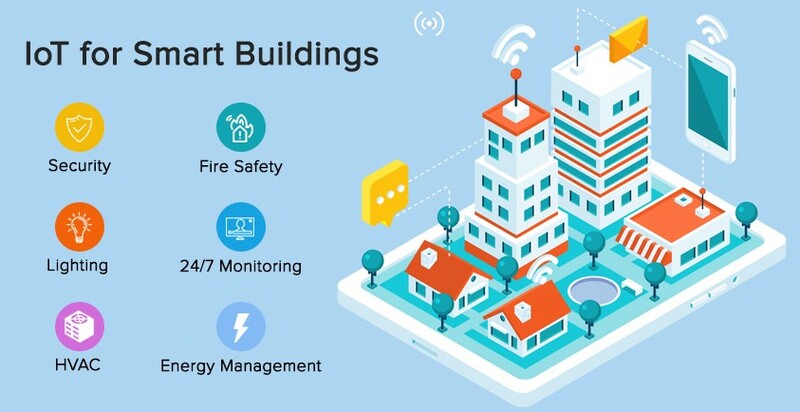 Or as Aniruddha Deodhar, principal for smart buildings and smart cities in Arm’s IoT Services Group, summed it up: Security, interoperability and connectivity abstraction are the three crucial factors about building automation. “Help customers and their managers connect any type of device to any other type of device, and to the cloud, without being encumbered by the burdens of protocols, and the alphabet soup that ensues with all that,” Deodhar said. Security is a special caveat. Along with exciting improvements in connectivity come serious responsibilities. IoT is still a new technology that hasn’t tackled security. “We think about security right from the foundational elements, right from the devices all the way to the cloud, including security in the communication itself,” said Deodhar. Looking for faults and anomalies in the building systems—another trend in building automation—is useful for more than security. “Fault detection and diagnostics (FDD), for instance, is now a reality,” said Siemens’ Ellis. FDD examines data from building sensors and can identify off-normal conditions, which can be used for alarms or just optimization of a system. While home automation systems are often too complicated for consumers to master, building automation systems take on even greater complexity, such as making elevators run more efficiently or allocating meeting rooms on the fly throughout the workday. And those automation systems are often specialized for various industries, offering different applications for factories, stores, and warehouses, in addition to office buildings. Making buildings more energy efficient has been one of the most important goals for building owners. The smart grid is key to energy efficiency. How do smarter buildings interact with the smart grid? Leading vendors creating building automation products include ABB, Cisco Systems, Creston Electronics, Delta Controls, General Electric, Honeywell International, Knight Watch, Lutron Electronics, Robert Bosch, Rockwell Automation, Schneider Electric, and Siemens. Arm last year acquired Sweden’s Mistbase and the U.K.’s NextG-Com to add narrow-band IoT technology to the company’s portfolio of intellectual property. The company is paying attention to the whole building environment, from cameras and lights, to sensors to gateways to servers, said Aniruddha Deodhar, Arm’s principal for smart buildings and smart cities in IoT Services Group. Security is a key focus for the company. Siemens has been acquiring building automation companies, as well. The Siemens Building Technologies Division bought Enlighted, a supplier of lighting control systems, which offers a sensor-based IoT platform for commercial buildings. Siemens also has just purchased J2 Innovations of Chino, Calif., which offers its Fluid Integration Framework software for IoT and for controlling, monitoring and operating automation systems used in large and small buildings. “Siemens Building Technologies offers a wide portfolio spanning from automation, security, and fire solutions, on to remote digital services and a world-class technical branch network for on-site service delivery,” said Ellis. The idea of smart buildings and smart infrastructure has been around for some time. The idea has caught on in places like China and in some cities in Europe, but in other markets the idea has seen a mixed reception. While it may be an attractive concept, in many markets there also has to be a strong business case. It’s also one of the reasons why smart buildings stand out so much, and why they are more often marketed at the very high end of the real-estate market. OVG Real Estate in the Netherlands designed what it touts as “the world’s smartest building,” constructed in Amsterdam for Deloitte. The building, called “The Edge” inspired OVG to form a tech-oriented subsidiary, EDGE Technologies, to capitalize on what it learned from building the Deloitte office, said Erik Ubels, OVG’s CTO, at the recent Internet of Things World conference. The Edge uses power-over-Ethernet technology for LED lighting and incorporates 16 types of sensors. Noise inside the structure is measured to provide quieter rooms. Solar panels provide some of the power needed. EDGE Olympic has a fiber-based IoT backbone, Ubels said, enabling monitoring and control of various features through a single smartphone application. There are 28,000 sensors in EDGE Olympic, according to Ubels, and future buildings are likely to have 100,000 sensors. Machine learning technology is incorporated in the coffee machines, elevators, in the “the whole building,” he said. No virtual machines or servers are inside the building; it relies entirely on cloud-based computing. The era of more sophisticated building automation is upon us, but how widespread this becomes isn’t entirely clear at this point. Smarter buildings make use of the computing cloud, the Internet of Things, artificial intelligence/machine learning, and other advanced technologies to keep workers comfortable, secure, and happy with their facilities. Now the question is who will pay for it. Threat levels rise as more devices are connected. Solutions are available, but they are often ignored. Technology gains moment, but important issues still need to be resolved to make this technology ubiquitous.